Below are the most common detours that take place when TARC goes on its SNOW ROUTING. Please check back to this page for more details. For more frequent updates, visit us on Twitter. Substitute 30-foot buses may be operating in place of the all-electric LouLift buses in downtown Louisville during icy weather. Service on Main, Market and 4th Street will remain in place and be fare-free. Buses move only as quickly as traffic allows. If there is snow or ice, consider taking an earlier bus to ensure that you arrive at your destination on time. Buses may slide on snow as they approach the curb. Stay on the curb until the bus comes to a complete stop. Especially on dark winter mornings, it’s important that you make yourself visible to an approaching bus. Wear light-color clothing. Signal your presence with a small blinker light or flashlight. Bus steps can become slippery from snow. Kick the snow from your shoes before stepping on the bus. Use the handrails and take your time. Although the ride should be warm, your trip to and from the bus stop may not be. Put on an extra layer – even a short wait at your stop can be dangerous if you’re not dressed for the weather. If the temperature on your bus isn’t right, please tell your driver so the problem can be fixed or reported to repair staff. If your bus is late, remember that your driver is doing his or her best to make sure you arrive at your destination despite bad road conditions. 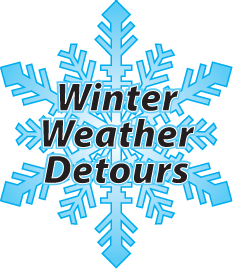 Know your route’s winter weather detour. Eastbound via VA Hospital – From Ewing Ave at Brownsboro Rd. bus will turn right on Brownsboro Rd., left on Zorn Ave., left on Country Club Rd., bear right at the fork to the regular bus stop at VA Hospital. Leaving VA Hospital bus will turn left on Country Club Rd. toward. Zorn Ave, right on Zorn Ave, left on Brownsboro Rd. to regular eastbound route. Missed stops: All stops between Brownsboro Rd. at Mt. Holly Ave to Country Club Rd. at River Bend Dr.
Next Nearest stop: Brownsboro Rd. at Hite Ave. Westbound via VA Hospital – Bus will follow regular route to VA Hospital. From the bus stop at VA Hospital bus will turn left on Country Club Rd. continue toward. Zorn Ave., then turn right on Zorn Ave., right on Brownsboro Rd. to regular westbound route. Missed stops: All stops between Country Club Rd. at River Bend Dr to Brownsboro Rd. at Mt Holly Ave.
Next Nearest stop: Ewing Ave. at Brownsboro Rd. Eastbound – From Trevilian Way at Dundee Rd. bus will continue Trevilian Way to Bardstown Rd., then turn right on Bardstown Rd. to regular eastbound route. Missed stops: All stops between Dundee Rd. at Fleming Rd. to Emerson Ave at Eleanor Ave.
Next Nearest stop: Bardstown Rd. at Winston Ave. Westbound – From Bardstown Rd. at Emerson Ave., bus will continue Bardstown Rd. to Trevilian Way, turn left on Trevilian Way to Dundee Rd. then continue regular westbound route beyond Dundee Rd. From Bardstown Rd. and Grinstead Dr., bus will turn left on Bardstown Rd., left on Highland Avenue, left on Barrett Avenue, right on Winter Avenue to regular route. Next Stop: Bardstown Road and Grinstead Drive. Eastbound – From Poplar Level Rd. at Audubon Plaza, bus will continue Poplar Level Rd. to Kmart Shopping Center, and then turn left into Kmart Lot. Missed stops: All stops between Audubon Plaza to Illinois at Poplar Level Rd. Next Nearest stop: Poplar Level Rd. at Hess Ln. Westbound – From Kmart Shopping Center, bus will turn right on Poplar Level Rd. to regular westbound route. Eastbound – From Eastern Parkway at Willow Avenue, bus will turn left on Willow Avenue, right on Cherokee Pkwy., right on Grinstead Dr., right on Lexington Rd. then continue Lexington Rd. to Alta Vista Rd. to regular eastbound route. Missed stops: All stops between Eastern Pkwy at Bardstown Rd. to Alta Vista Rd. at Lexington Rd. Next Nearest stop: Lexington Rd. at Altagate Rd. Westbound – From Lexington Rd. at Alta Vista Rd., bus will continue Lexington Rd., then turn left on Grinstead Dr., left on Cherokee Pkwy., left on Willow Ave., right on Eastern Pkwy to regular westbound route. Next Nearest stop: Eastern Pkwy at Bardstown Rd. Eastbound via Middletown Center to Eastpointe – Bus will follow regular eastbound route to English Station Rd. at Old Henry Rd. (R/R crossing), then turn left on English Station Rd., continue English Station Rd., then turn right on Lagrange Rd. to regular eastbound route. Missed stops: All stops in Berrytown along Heafer Rd. Next Nearest stop: Lagrange Rd. at English Station Rd. Westbound from Eastpoint via Middletown Center – Bus will travel the regular route from Lagrange Rd. at English Station Rd., then turn left on English Station Rd., right on Old Henry Rd. onto English Station Rd. to regular westbound route. Next Nearest stop: English Station Rd. at Old Henry Rd. From Outer Loop at Vaughn Mill Rd., bus will continue Outer Loop to Outer Loop Plaza, then turn left at traffic light to enter Outer Loop Plaza. Bus will then bear right immediately and proceed to stop sign. Bus will then turn right at stop sign (leaving Outer Loop Plaza), then right on Outer Loop. Bus will not travel on Summerfield Drive, Patty Jay Road, Sudbury Lane, Winterhaven or Tempsclair Roads. Bus will continue on Breckenridge Lane, then turn left on Landside Drive, right on Six Mile Lane to regular westbound route. Bus will not travel on Gagel Ave., or Estate Dr. between Gagel or Anna Ln. Southbound – Bus will follow regular route to Estate Drive and Anna Lane, then turn left on Anna Lane, right on Manslick Road to regular route south of Gagel Ave. Missed stops: All stops from Estate Drive at Hobart Ct to Gagel Ave at Manslick Rd. Route will not be able to provide serve to Hunting Creek Subdivision. From U.S. 42 at Timber Ridge Drive, bus will turn left on Timber Ridge Drive, right on River Road, right on US 42 to Fox Harbor (near Park & TARC lot). Next Nearest stop: US 42 at Fox Harbor Rd. Route will not be able to service Knob View Apartments. From State Street and Coyle Avenue bus will turn right on Coyle, left on Daisy, left on State St to regular route. To UPS Edgewood – From I-65 South and Grade Lane bus will turn left on Grade Lane, right on Preston Highway, right on Alder Avenue (Opposite Gilmore Lane), bear left onto Lotus Avenue then continue to Edgewood Loop. To Worldport Center – From Edgewood Loop, bus will turn left on Lotus Ave., continue onto Alder Lane, then turn left on Preston Highway, left on Grade Lane then continue to Worldport Parking Lot. From Grade Lane at Edgewood Overpass, bus will continue Grade Lane, the turn right on Preston Highway, right on Alder Lane (Opposite Gilmore Lane), bear left onto Lotus Avenue then continue to Edgewood Loop. Reverse to UPS Worldport.